Many parents find telling their children about their impending divorce difficult, and so they avoid or delay telling them. But be sure to talk with your children from the start of the process to reduce their misunderstanding and uncertainties. In spite of a divorce, the focus should always be to continue to create a sense of belonging and acceptance in your child. Children need love and understanding of their concerns, to help them deal with divorce. As you share what is happening with your children, it helps to prepare them for the changes that will occur in their lives. The information could increase their understanding and help to move from denying of the situation. As parents, you need to explain divorce and what is happening, to your children in an age-appropriate way. The discussion should take into consideration the children’s age, maturity and temperament. This could include some of the problems that lead to the decision, but generally, children don’t need to know all the reasons. You might have to explain several times for younger children, as they might not understand, or willing to accept it that their parents will not be living together. In you discussions with your children, try not to cast blame, or say negative things about each other. It is important that you encourage your children to talk and ask questions about the divorce. Then take the time to listen to them as they express their concerns. Be attentive to what they are saying, and make sure that your verbal communication reflects your body language. You children want to know that you really want to understand their feelings and perspectives. Don’t allow them to bury their feelings about the divorce because they are fearful of your reactions to their concerns. Instead, invite your children to share the things that they are most anxious or worried about, then try to reassure them. For example, some children might feel that are to be blamed for the problems that led to the divorce. They need your reassurance that this is not so, but it was a decision their parents made. As you help your children to understand that they were not the cause of the divorce, or the problems you face as a couple, they also need to know that both of the parents still love them. Use the opportunity to explain that while mom and dad are divorcing, they still special and dearly loved by their parents. Help your children to understand that even when the marriage ends, they will still have you. Sometimes to please their parents, children are inclined to take sides. Let them know you want them to have good relationships with both parents, and that’s fine. Even more, don’t fight before children, but try to model the same kind of behavior you want them to show when they are in conflict with others. Children react to the news of their parents’ divorce with varying emotions including intense sadness. In fact, they might need some time to grieve the loss of their family as they knew it. Try to help your children to open up and talk about their feelings and concerns, or get the help some other family member who they trust. This could help them to ease the pent-up emotions in a healthy way. You will need, however, to recognize signs of deepening stress resulting from the divorce that could result in depression. Depression in school children does not present in the same way as older children and adults. So they might become more physically active as opposed to being low in energy. You will need to get professional help for your child if the depression persists. Try to discuss changes that are directly related to your children ahead of time. For example, a much you possibly can, discuss with children the living and school arrangements. Be as specific about your plans and continue to reassure them to ease the sense of uncertainty that they might be experiencing. Try to handle changes in living arrangements with the sensitivity it requires. 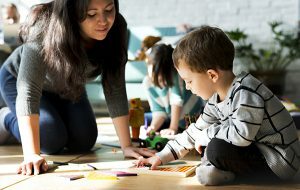 What is important, is that you place the children’s interest as the priority, and try to cut down on some of the anxiety they might experience. Also, as much as possible, try to maintain some level of consistency in your children’s life. With your support, you can help your children adjust to divorce. This gives them the reassurance they need to bounce back, and thrive. However, this takes effort on your part as parents, and means responding to your children concerns and needs. When tension is managed, and a nurturing atmosphere prevails, this facilitates your children’s optimal development in the face of the changes. HelpGuide (2012). Children and Divorce. Retrieved from www.helpguide.org. Accessed April 2013. Kids Health (2013). Helping Your Child through a Divorce. Retrieved from KidsHealth.org. Accessed April 2013. Legal Separation or Divorce – What is the Difference? Uncontested Divorce Without Children – What are the Steps?